After two consecutive attempts in 2014-2015, it was the third attempt in 2016 for the first ever vegan conquest of Mt. Everest by our very own Kuntal Joisher. It was an undisputed victory not only on Everest, but also on Eight thousands risky peak Mt. Lhotse, with Mt. Manaslu. Kuntal was very excited. He is maintaining his regimen extraneously. Despite being a Gujarati, he is mentally a Mumbaikar. Kuntal not only treks the Sahyadri ranges, but also the Greater Himalayan mountain range. He loves the local people, nature, flora and fauna. Kuntal’s group adventure trekking is an attempt to let loose the loving personality to the mountains and especially to the hikers. Kuntal had begun his hiking in 2009. Me and Maharashtra Police’s first Everester, Mr. Rafiq Shaikh went to meet Kuntal Joisher, a precious gemstone of our area – Ghatkopar. We were already acquainted but this was a special detailed visit to his home. On 19th May 2016, our hero attracts the attention of the world due to an unbelievable performance in the world of mountaineering. With his motivation, what did he accomplish that the whole world took note of such a tremendous attitude? Simply put, in the spring of 2016, Kuntal hoisted the Indian tricolor on the highest peak of the world – Mount Everest. If you look at it generally, there is nothing special in this news. Every year hordes of people climb the topmost Himalaya. 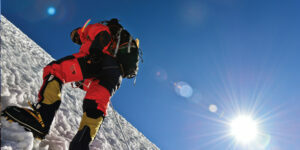 Many of them are not aware of even the mountaineering basics. Their ego acts as a strange obstruction in a big way. If someone is popular to teach the world about climbing, it works well for some. 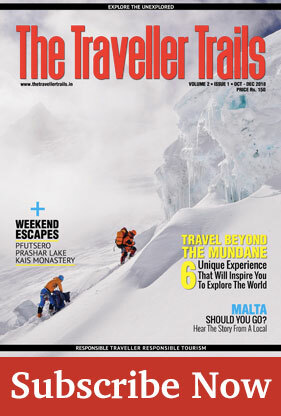 However Kuntal, a man true to his roots has kept his distance from people who fail to respect the art of mountaineering. It is only because of the unusual thriller and unmatched ability in mountaineering that the success stories become unique ones. 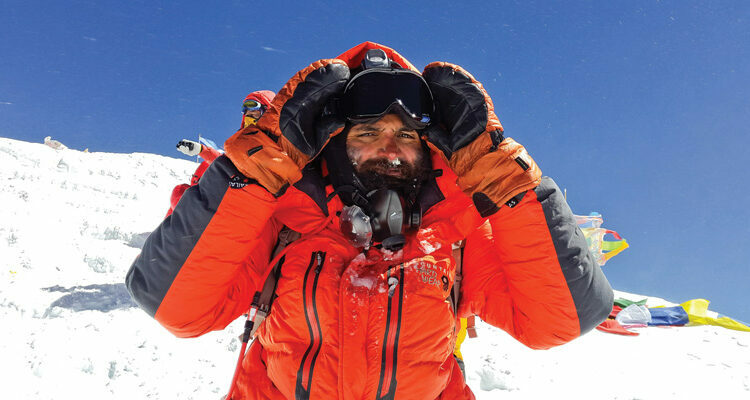 Kuntal’s uphill climb of the Everest was not a simple task. This was a unique attempt. In the world of tiredness and even in the world of food habits, he had won an impenetrable, invincible and wonderful battle. The summation of this is that the extraordinary Kuntal Joisher became the world’s first-ever “Vegan” summiter of Everest. Kuntal Joisher takes the last few steps to reach the summit of Mt. Everest. A view of the final summit ridge of Mt. Everest as shot from the south summit. 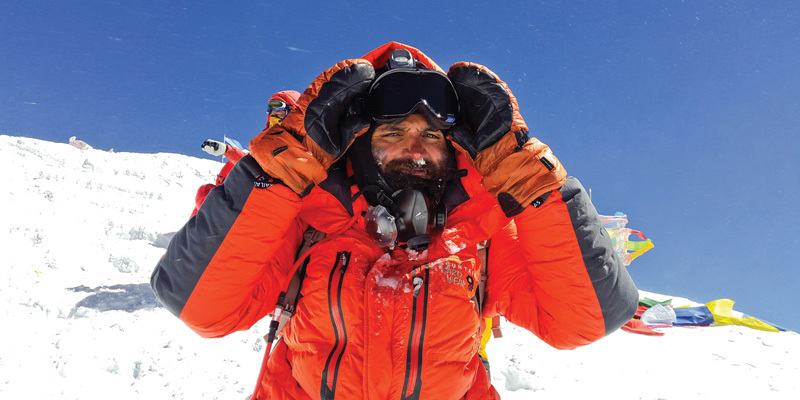 Can such a “vegan” aim to best the highest peak of the world? No one had imagined such a thing, no one had ever tried it. 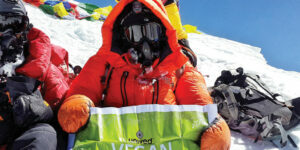 On a multi colored cover of a popular periodical in the world of vegans, a super fighter hailing from India features who has touched the hallowed heights of Everest. A height which is not a normal matter to touch without its own will. Kuntal Joisher and Mingma Tenji Sherpa on summit of Mt. Everest on May 19th 2016. The importance of diet and exercise in his life and resultantly the ability to run is of paramount importance in Kuntal’s life. Along with the other necessary exercises while preparing for Everest summit bid, Kuntal used to run in the night. This, according to him is the strange remedy for the traffic problem in Mumbai and also for de-stressing in summer. After such a tremendous and rigorous exercise for months and years on end, Everest’s summit wasn’t perhaps that big a challenge anymore for him. Due to the unusual changes in the weather that year, many climbers were disrupted by snowballs, many lost their hands and feet for life and many important parts of the body had to be cut off. But through this terrible crisis, Kuntal luckily survived. 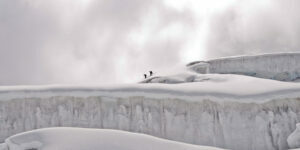 Climbers near Camp 1 of Mt. Manaslu. In 2014, Kuntal tried an aggressive attempt on the Everest before the successful one in 2016. But that year, a very big avalanche accidentally happened on the Everest leading to 17 sherpas loosing their lives. All further expeditions were held off by the Nepal government in that year. Most would have preferred to sit at home and thank the creator for saving them from such a huge accident. But our hero is cool in his own quirky ways. In the same year, he wrestled the 8th highest peak in the world – Manaslu in Nepal, and pulled it off. 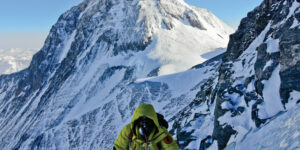 Many climbers take a break after an Everest win, because of multitude of reasons. 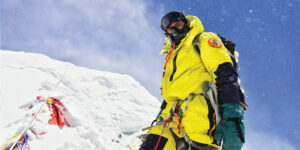 Kuntal celebrated his Everest feat by a victory on Mount Lhotse, the world’s 4th highest snowfall area. Kuntal Joisher at the start of the Reiss couloir, the gully that guards access to the top of Mt. Lhotse, the 4th highest mountain in the world. Mt. Everest makes for a spectacular background. 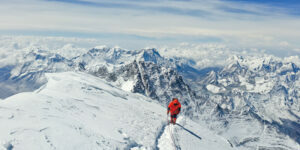 A part of the Everest massif, Lhotse is connected to the Everest peak via a single pass – the notorious South Col. This peak is perceived as a more difficult climb than Everest itself. It’s too easy to succumb in such a terribly diminished temperature filled with dreadful snowstorm and dangerous avalanches. The hidden snow-clad route turns fatal with every change in the atmosphere. It is the toughest class above all and is very difficult to ascend the range. On 15th May 2018, Kuntal Joisher defeated all these challenges. At the same time, he made a successful ascent of Lhotse. He went two steps ahead of general vegans and used artificial warm clothes and socks made from dumplings of certain types. Artificial woolen costumes were used, with nil animal product or derivatives. Not only that, he learnt to operate the tools and material and created a skilled income from this belief. Because of his Kacchi lineage coupled with his engineering background, these merchandise are now produced at the international level. The ascent of Mt. Everest and Mt. Manaslu made a wholesome breakthrough in veganism and climbing history. But his mind did not believe that it was a 100% vegan effort. This is because he had Down feather and gloves while climbing both peaks. But while climbing the summit of Lhotse, Kuntal went with the 100% ‘vegan’ way, and refused any and all animal or bird-material derivative products. Kuntal Joisher on top of mount Lhotse in the first truly vegan mountaineering expedition, sporting his gear, free of Down or Leather. It is of paramount importance that everyone has the right to live. Kuntal’s efforts bolstering this theory was a great reward of success for everyone who believed in him. Everyone prefers the toughest equipments in such expeditions. But history isn’t made without crazy, and sometimes the most insane people make it happen. The smooth natured Kuntal is a worshiper of mankind, who is a true priest of humanity and an honest proponent of non-violence which is the greatest feature of his mountaineering spirit. Grateful for his access to the Himalaya’s high peaks, Kuntal still visits his alma mater, the Sahyadri cliffs leaving aside all his tasks. Due to the rock climbing experience in the Sahaydris, it is comparatively easy to compete with the challenging Himalayas which features constant contact with rocks and stones. Even the highest mountains seem to be easily trapped by Kuntal’s soft guile. Mountaineers descending from Camp 1 of Mt. Kun in Ladakh. 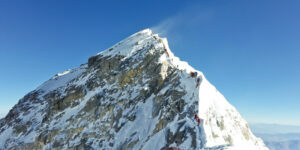 After the failed attempt on Everest in 2014, the disaster caused by the earthquake that year, 21 climbers including many Sherpas lost their lives in Nepal. A highly distressed Kuntal using his Himalayan photography exhibited a presentation to earn a healthy amount of money, which he totally spent on the Sherpa families. The kind hearted mountaineer is also a very sensitive citizen. Despite his success, Kuntal remains as far away from publicity as possible, one of the prime reason why he is not very familiar in the small area of Ghatkopar. 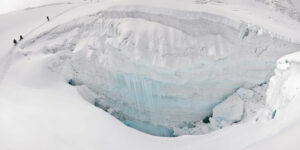 Panoramic view of the gigantic crevasse near Camp 2 of Mt. Manaslu. Kuntal Joisher and team on Chulu Peak Expedition in the winters of 2015. The commitment of Kuntal is definitely unique whether be it for family, relative, society or climbing. He wants to give time to everyone who is familiar with him. He appreciates the time thus spent. In spite of battling the stony-rocks and cold ice, his heart remains always warm for the upliftment of the society. Kuntal’s home environment is very friendly and we are welcomed warmly to his house. 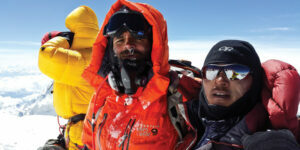 In 2015, Kuntal and Rafiq Sheikh had crossed paths on Everest. Although he himself is a vegan, his hospitality is by no means limited as he ladles us with milkshakes and a variety of food. We also met his distinguished wife – Dipti, as well as his lovely mother. He welcomed us with much love. We were much obliged by his openness. Kuntal’s father has been bedridden for more than 15 years, so much so that for Kuntal and Dipti, he is a small child in a veteran old body. He is associated with “Sunsar Maya” (https://www.sunsarmaya.org/donate/) working for the development of poor, destitute children and women. He gives his valuable time as well as other important contribution to this charitable organization. Kuntal is continuously doing great work through his favorite hobby – climbing. Kuntal guides acquaintances as well as many other people into the Sahyadri and the Himalayas. The money raised by this fund is given to the organization for the betterment of children. This should be enough to get an insight of the gentle-madman mountaineer. Kuntal Joisher ascending the ice-wall guarding access to the top of Chulu peak in Annapurna circuit.